The Mungo Outback is a hotspot for colourful parrots and cockatoos. 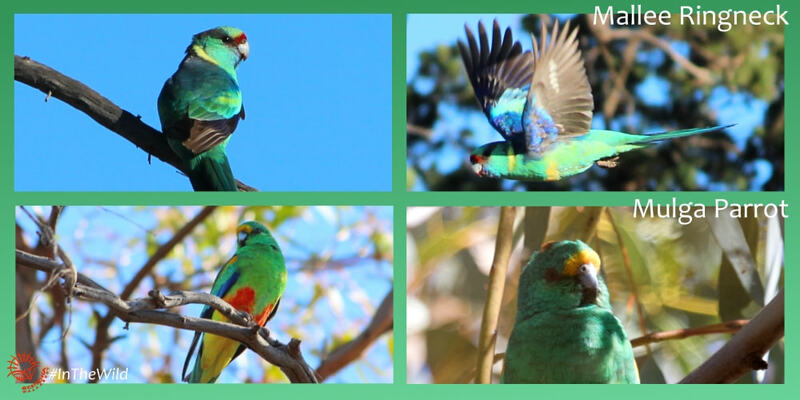 The Mallee Ringneck, Mulga Parrot and Rainbow Lorikeet stand out for sheer vibrancy, the olive and gold Bluebonnet shows best when flying, the Regent Parrot is striking in yellow and black, and the big cockatoos show off in watercolour shades of pink, lemon and grey. For wildlife photographers, a visit is a must. Over the years we have seen fifteen species of parrot and cockatoo on the Mungo Outback Journey. Here they are, grouped by colour. A small parrot and a lorikeet, both with blue faces. A quiet shy parrot coloured in olive and tan on the back that makes them easy to miss when they feed on the ground. When they fly, their stunning electric blue wings and yellow shoulders surprise. A fairly recent arrival in the region, the Rainbow Lorikeet is now a regular sight around Mildura and Wentworth. 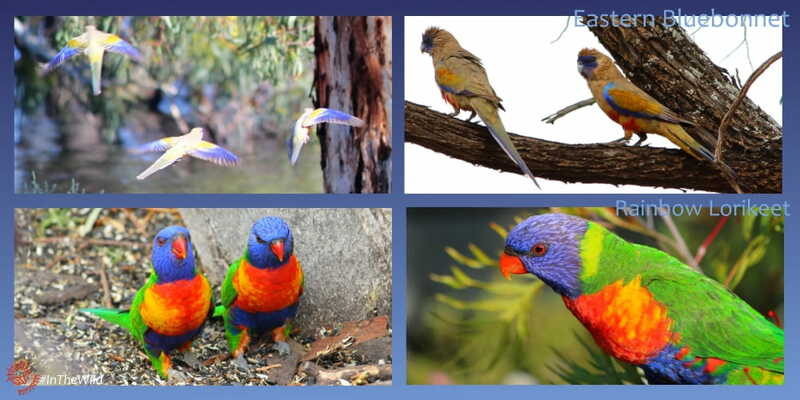 They are large for a lorikeet, noisy and social and dress in every colour of the rainbow. Two glowing parrots of the river country of Hattah, Mildura and Wentworth. Regent Parrots are known as Smokers by locals, due to their speed through the air – they go by so fast all you see is their smoke. They are large and shy and fly into the top branches of tall River Red Gums around Hattah Lakes. The male shines with a bright yellow head, breast and wing band, while the females have a green-yellow head. Strangely, this parrot is the same species as the bright red Crimson Rosella of the coast and mountains, but just yellow instead of red. 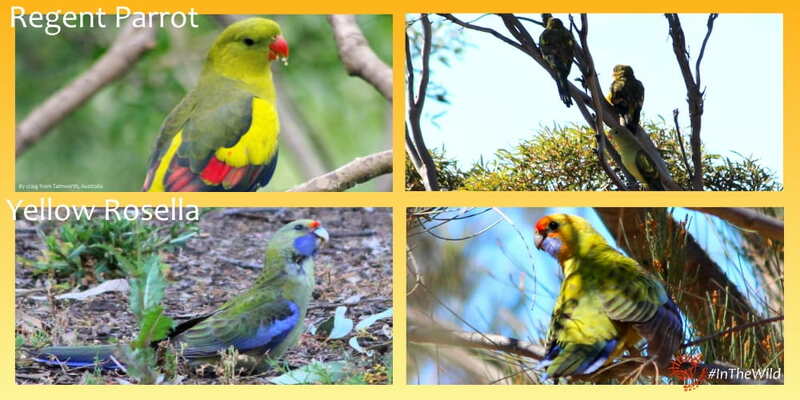 Young birds are yellow-green, all have a blue cheek. Two large cockatoos painted in striking white, with lemon underwings. 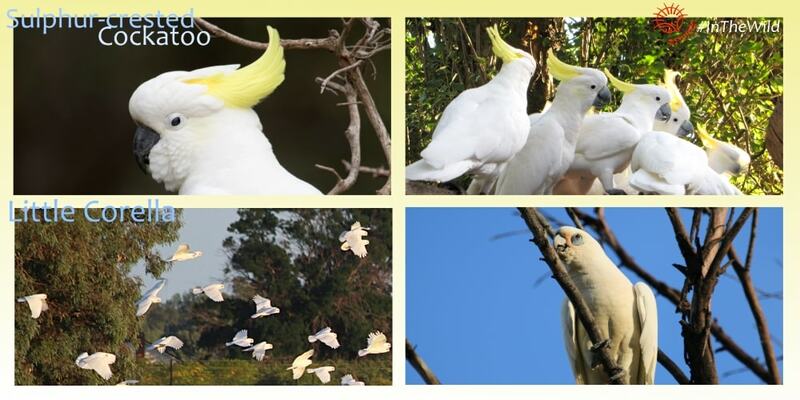 Large, brilliant with a prominent yellow crest, this cockatoo is seen in small groups around the waterways and settled districts of Wentworth, Mildura and Hattah. Smaller than the Sulphur-crested Cockatoo but more inclined to form huge flocks, the Little Corella has a small white crest, pale blue eye-ring and a wash of pink on the lores (the area between eye and bill). Two medium-sized parrots of the dry forest, both coloured in turquoise, green, cobalt, red and yellow, and a blue-green parrot of the river country. This parrot has a red forehead and a gold ring around the neck which gives them their name. Both sexes are brightly-coloured. A little more shy than the Mallee Ringneck and harder to photograph, the male Mulga Parrot has a yellow forehead and red belly. The female is less brilliant and lacks the red belly. A small brilliant parrot – the male is turquoise, emerald and blue with a red rump, the female is olive and green and lacks the red. These birds prefer the river country. Two large cockatoos with delicately beautiful pastel colouring. A large pink and white cockatoo with a huge pink, orange and yellow crest. They are usually seen in small parties in the driest parts of the Mungo region. 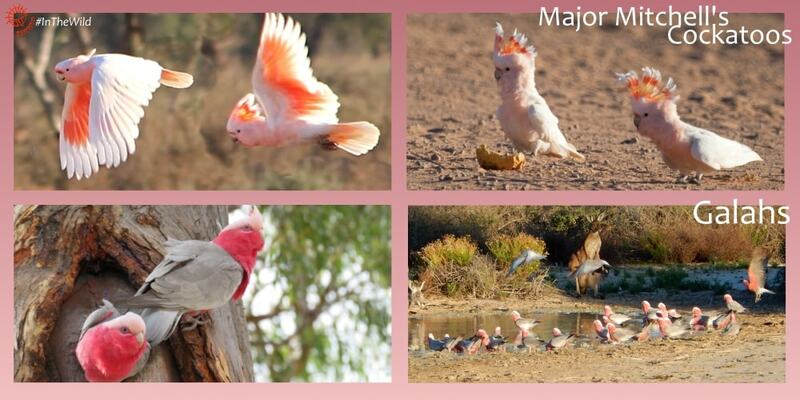 Distinctive in their pink and grey plumage, Galahs live throughout the Outback. They can be seen in large flocks drinking from waterholes in the evening. We have only seen these parrots on one occasion each – these species irrupt into the region in good years. Both species are known as pets, but seeing them in the wild is an experience never to be forgotten. A fleeting sight of a tiny green parrot flying at speed in November 2016 with the Ventures Birding Group. The distinctive call and small size helped us identify this tiny green and gold parrot. Only seen in 2010, but in good numbers and seen several times on that trip – this lovely medium-sized crested parrot is coloured in grey, white and lemon with an orange cheek patch. Females lack the lemon face. To see them in flight is magic – they have pointed wings and a long tail, quite like a falcon. The best time to visit the colourful parrots of the Mungo Outback is March to November. Our 4 day Mungo Outback Journey is booking now.